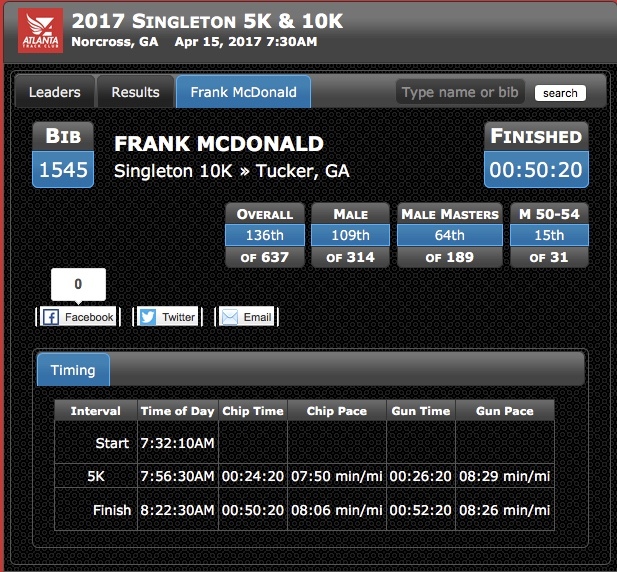 The Atlanta Track Club Singleton 10K in Norcross has always been a good race for me. I've set new personal records for the distance both times that I have run this race. I joined a course run with Tucker Running Club (TRC) last Saturday, on a 40 degree morning, and managed to keep fairly close to the faster group until the last mile. I felt really good about my run that morning and was optimistic that I could have a good outcome today if the temperature wasn't too warm. We had a great turnout from the Tucker Running Club! 34 made the photo op at 7:15 am. Several others joined the race but missed the photo due to pre-race warm-ups with training groups. There were several PRs from this group today, and several age group award winners. 5th woman overall, and 25th out of all 941 5K finishers, with an incredible time of 19:31! The temperature this morning was around 60 deg F, but I was more concerned about how I would perform, not having slept enough during the week, or the night before. Fortunately a two-mile warmup before the race with Brian helped to perk me up. I joined wave B for the start, for runners at a 8:30 min /mile pace or faster. As we walked up to the starting line after wave A had begun, I found myself toeing the starting line. I wasn't too concerned about being out in front, after all I was hoping to run about an 8 min / mile pace. When the airhorn sounded for our start, exactly two minutes after the leaders in wave A, I took off on a fast sprint. One man moved well ahead of me. 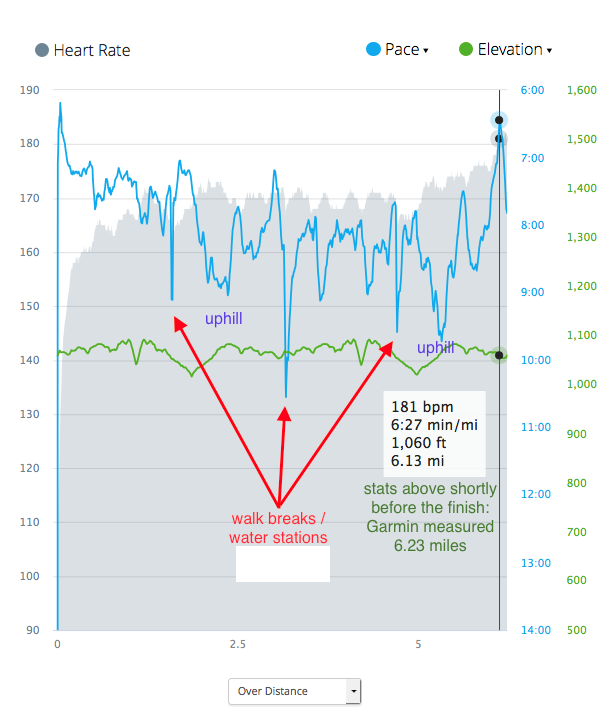 I felt like I was leading the remainder of wave B in the first mile, and the downside of that pace was that I felt the rest of the pack hot on my heels. Myriam of TRC kept up with me for a few minutes, as she was hoping to use me as her pacer. (I was just hoping that she would not outrun me!) For the first half-mile or so, I tried not to check my watch, and when I did, I realized that I had started at about a 7:15 pace. I tried to dial back my speed just a bit, knowing that I couldn't maintain that pace for another 5-1/2 miles, but I felt strong. I covered the first two miles in 7:20 and 7:45, including a short walk break at the water station about 1-1/2 miles into the route. Finally I slowed a bit more in the third mile, to 8:20, and crossed the 5K timing mat at 26:20 on the race clock, 24:20 official chip time. I took a walk break at the second water station, just past the timing mat. In a moment of reflection (actually about 20 seconds), I knew that I had run that first lap much too fast. 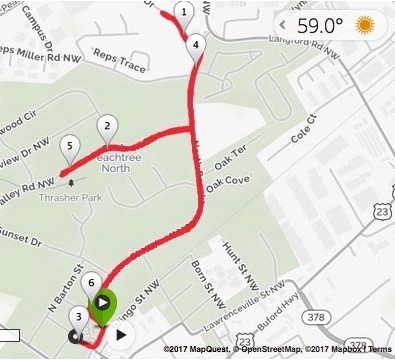 In last year's PR-setting race, I finished the first loop in 25:16, but had taken a minute more to complete the second loop. I could set a new PR today if I ran the second 5K in less than 26:30, similar to last year's second loop. I was feeling a little tired, but perhaps no more than last year at this stage. I just needed to hold on and run as fast as I could manage. Most of all, I didn't want too many people to pass me in the second loop. It would be embarrassing if I couldn't maintain a reasonable pace after having started out so quickly. It took me 8:25 to cover mile 4, which was a full minute slower than the first mile of the first lap, but with elapsed time of 31:50 at that point (under 34 minutes on the race clock), I had just set a PR for the 4-mile distance. I ran the fifth mile at a similar pace, 8:20, setting another PR for the 5-mile distance at 40:10. One of the fun things of this race with several out-and-back stages was seeing a few of the faster runners that I know from TRC and other running groups a couple of minutes ahead of me, and many of the other 10K runners a few minutes behind me. It seemed that they were all cheering me on as we passed each other, especially in the second loop. Sorry I wasn't able to reciprocate with much more than a thumbs-up: I was concentrating on breathing and running at the same time! Your support was greatly appreciated!! Thanks Bonnie, as well as Samantha, Jessica, Nicole, Robin, Bob, Curt, Richard, Myriam, Wende, Carolyn, Sue, Carol, Linda, Katie, Priscilla, and undoubtably several others that I've missed in this acknowledgement. Even though the beginning of the sixth mile was a steep uphill out of a ravine, I didn't want to look like I was "weak" or "struggling" in front of friends that weren't far behind me! The 6:27 min/mi speed at 0.10 mile before the finish line was definitely gravity-assisted! The temperature seemed to increase as I ran up the hill. I almost always wear a cap when running, largely to protect my balding pate from the sun, and also to keep the sun out of my eyes while running in an easterly direction in morning races, but I felt that it was keeping my head too warm. We reached the top of the hill as we turned back onto the main road. Heading south toward the finish, I took off my cap and tucked it into the race number belt on my back. I immediately felt cooler, and kicked into a higher gear now that the road had leveled out. In this stage, I kept up with most of the runners around me, although we were passing many of the slower 5K runners and walkers. I had to be a bit careful at times, tucking an arm close to my body so that I wouldn't bump into anyone as we raced by. The cone truck passed us going outbound, after which we ran in both lanes of the road for the remainder of the race. As the park came into view, I saw the race clock marking the 6-mile mark: 50:40 - which with a two-minute delay, meant that I was at 48:40, having covered mile 6 in 8:30, only 10 seconds slower than the first time around. Could I run the final 0.22 mile in 80 seconds, breaking the 50-minute barrier? I wasn't sure about that, but I was confident that I was on track to set a new PR, as I knew that I could run the final 0.22 mile in 2 minutes or less. I began pumping my arms hard, building up as much speed as I could manage. Volunteers and a few of the 5K finishers were cheering us on to a strong finish. I passed a couple of the other 10K runners, turned left at the second corner of the park, racing down a steep downhill as fast as I could manage, without mowing down any of the 5K finishers on my left. I was flying! This bird was also gasping for breath, but not - much - further - to - go! More volunteers were cheering us into the third corner of the park. I could see the finish line clock in the distance, at the fourth corner, reading 51:51, which for me meant that I had 9 seconds left to finish within 50 minutes even. Unfortunately I knew that I would not cover the last block in 9 seconds. As the clock ticked over to 52 minutes, I let off the gas a little bit, knowing that I was still going to smash my course record, and would set another PR for the 10K distance, even as a couple of other 10K runners pulled ahead of me. As I crossed the finish line, I allowed a big fist pump, and stopped my watch before I had slowed to a walk. 50:18!! (official chip time, 50:20, 8:06 average pace) Brian, Beverly, Curt, Jennifer all congratulated me as I was finishing! I looked around for the water for finishers. I must have given a volunteer a bit of a scare - perhaps I looked a bit dazed - and she said "You need some water!" and she ran over to the water station and returned with two cups of water, which I gratefully accepted. Curt said, "Keep on walking!" to avoid cramping up. I was so thrilled to set another new PR on this course, and tantalizingly close to a 50 minute finish! I'm very proud of this result, although I didn't run a negative split. Despite running my best race ever, my age group ranking was 15th of 31 finishers, right in the middle of the pack. Overheard after the Topgolf 5K: "Those old dudes are fast!" Marathon training has helped with the shorter races in many ways. I'm better prepared in terms of hydration, my flexibility is better with the constant emphasis on stretching, and mentally I'm much tougher when faced with a challenge in a shorter race. Regularly working out with slightly faster people over the past couple of years has definitely helped me to improve my speed and endurance. 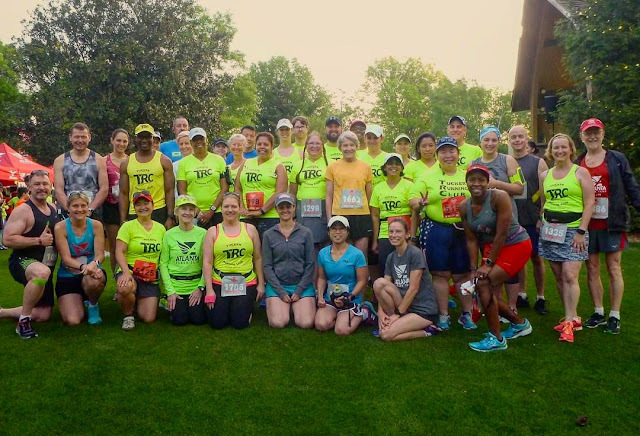 Most of all, there are so many people that I've met from various running groups, not only Tucker Running Club and runningnerds, but also from Atlanta Track Club training programs and the Thursday evening runs out of Big Peach Running Company in Decatur. When I ran my first Atlanta Track Club race three years ago, I did not know a single person at the race. Today, there are dozens of people that greet me at every race, whether merely race acquaintances, regular workout buddies, or closer friends that I've made through running.